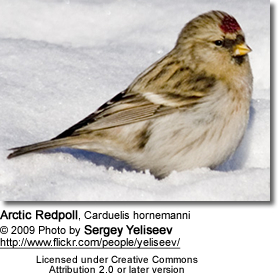 The Arctic Redpoll, Carduelis hornemanni, is a finch that breeds in tundra birch forests in Scandinavia. Many birds remain in the far north. But, depending on availability of food supplies, some birds migrate short distances south in winter - some have gone as far south as Britain. 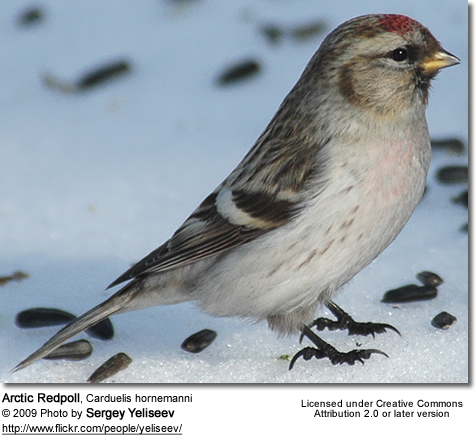 They sometimes travel with Common Redpolls. Outside the breeding season, they can form large flocks. The Greenland race, in particular, is rather large, averaging 12 to 14 cm (5 - 6 inches), including its tail. Their beak is small. The plumage is generally pale. In fact, the male is sometimes described as a "snowball". The rump is white. Some yellow and grey-brown tones are visible in their plumage. The females are also pale, but are more streaked on their breasts, sides and rumps. The average clutch consists of 4 to 7 eggs, which are incubated for 9 to 12 days. 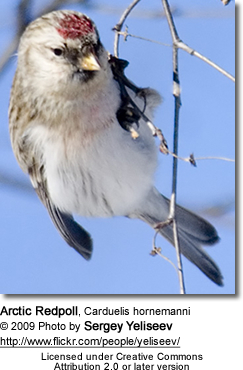 The Arctic Redpoll typically builds its nests in a large bush.